Collapsible, flexible tanks can be used as a part of a drinking water storage system. Due to the unique design of these tanks, they can be used in cisterns, underneath porches or in crawl spaces, and even installed outdoors. Our tanks can be built to custom dimensions and are available in sizes up to 210,000 gallons. Ideal for supplying water to a business, home, or remote location like a cabin where bulk water storage is required. 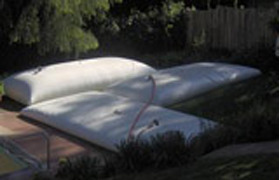 The flexible water Pillow Tank is an economical water storage system designed to help store various types of liquids including drinking water. These tanks are built with robust fabrics that allow them to hold up to various outdoor conditions, as well as safely store your potable water. These tanks can be an extremely economical storage option and are especially useful in terms of shipping and fast setup. To learn more about these flexible drinking water tanks and how they can be used in your location, please check out our Collapsible Flexible Tank for Drinking Water page.